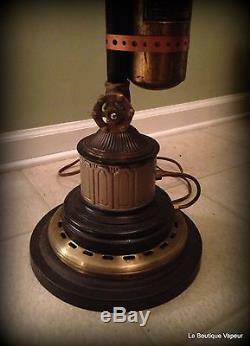 Our Steampunk lamps & other goods are made by Anthony at La Boutique Vapeur. Each piece is one-of-a-kind, and lovingly built in the depths of his garage. With built in dimmer switches, plaques with interesting historical diddies, old vacuum tubes, guns or milk glass... You never know what you may find in Anthony's workshop. All items made are created from recycled antique & vintage materials. 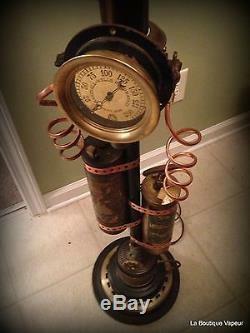 Most are made from quality wood, solid brass & copper parts and pieces. This unique fan oscillates and has three speeds to choose from. The on/off handle is the HOT cut off handle on the top, and the little round piece next the handle spins when the fan is oscillating. The head tilts up and down for an extra choice as to where you want your breeze to come from. 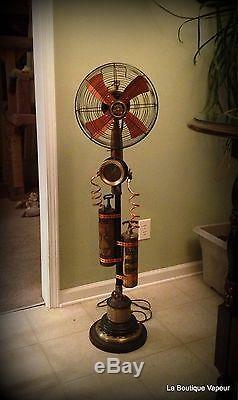 This fan is: 50" tall x 13" across the widest point. 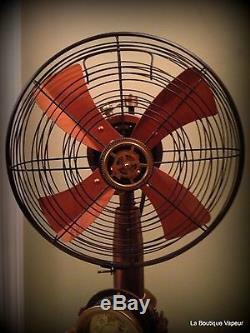 Note: the fan head is a new item, not recycled. 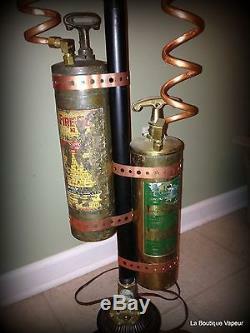 This piece is made with recycled materials. Parts have natural wear and tear, dings, flaws and will arrive in this condition. The item "Steampunk floor fan industrial handmade one of a kind gauge electric collectible" is in sale since Friday, February 19, 2016. 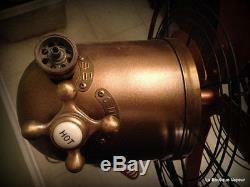 This item is in the category "Collectibles\Kitchen & Home\Electric Fans". The seller is "sumrak1" and is located in Clayton, North Carolina. This item can be shipped to United States.